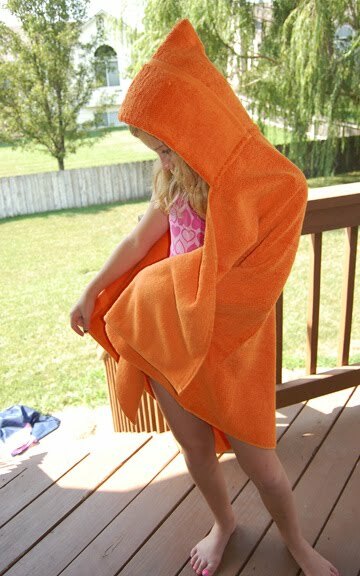 So without further yammerin’ on from the family story book, here’s the How-To on sewing a hooded towel. Its sporting a never-fray, flat-felled* seam variation. That will be cool, right? 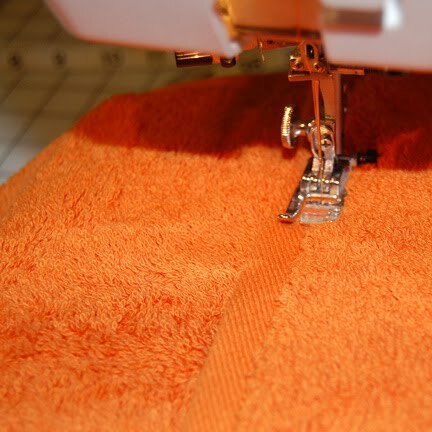 First, fold the short ends of the hand towel in towards the center. 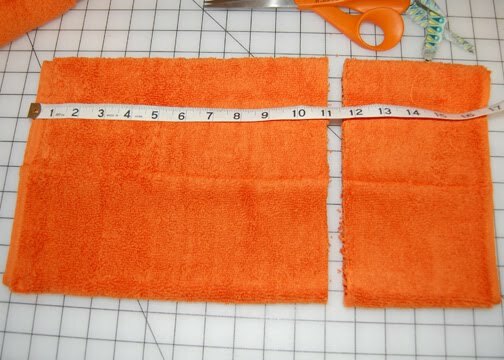 Each fold should be about 5″ wide. When I fold in the sides, I like to hide the tag inside the fold. The main bath towel wash/care tag will be visible, and really, one is enough, right? 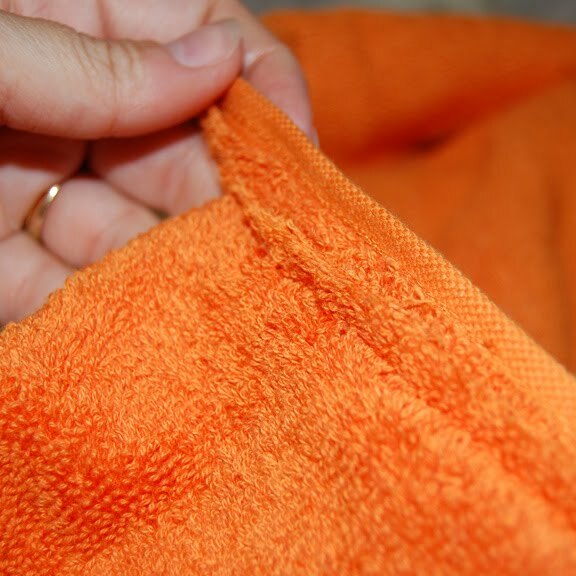 The way the short ends are folded, laying on the towel, pictured above- that will become the “right side” of the hood. Stitch along the factory hemmed edge to hold the folds. 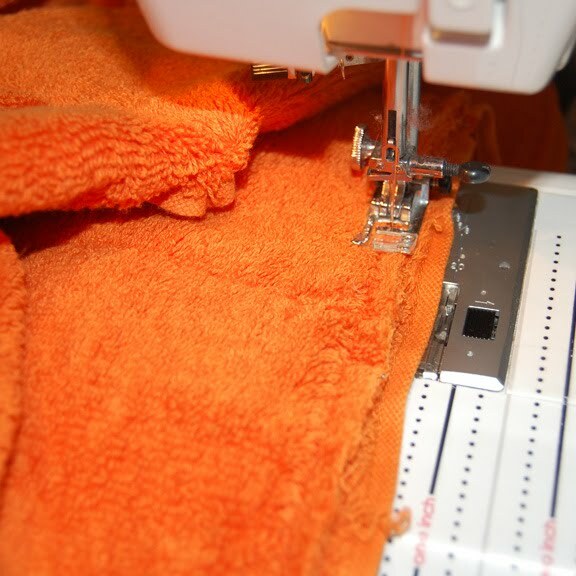 I stitch right where the terry cloth meets the factory hem. 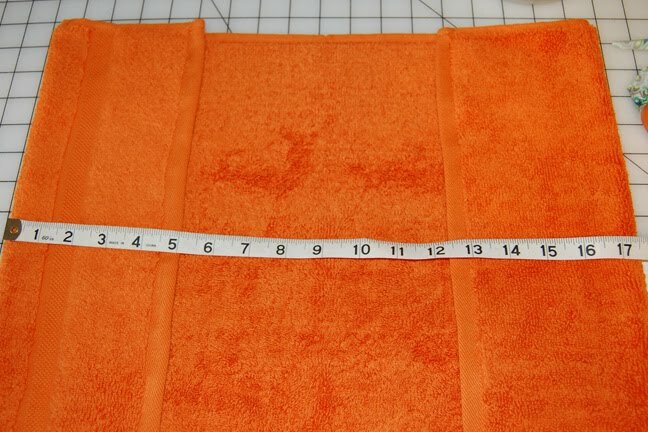 I find the big terry cloth loops hide the stitching line very well. 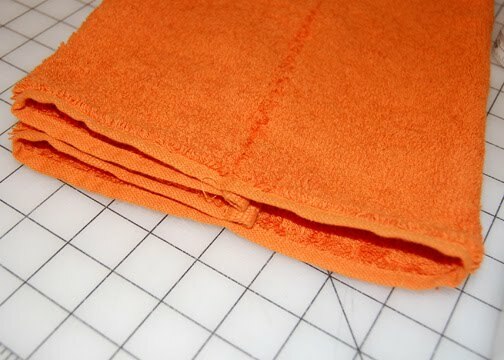 Match the right sides and fold the hand towel in half in half to form the hood. 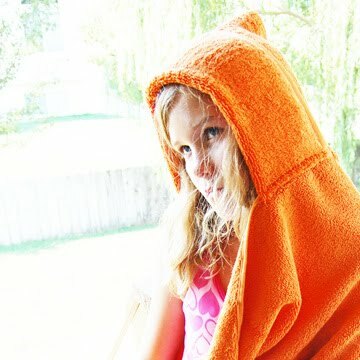 Stitch along the top edge of the hood using about a 3/4″ or 1″ seam allowance. 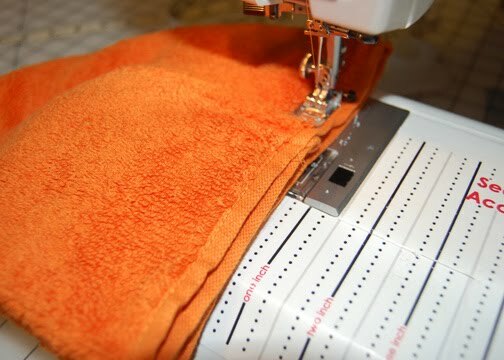 You want to use a wide seam allowance so that your sewing machine won’t have any trouble going through the any layers of towel. Back stitch at the beginning and end of this stitching line. 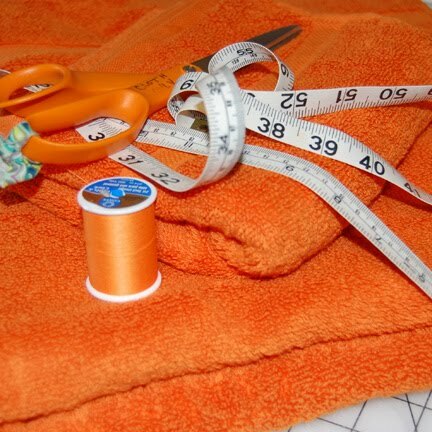 While the hood is still folded inside out, measure 11” from the top edge. (This is the edge you just stitched.) 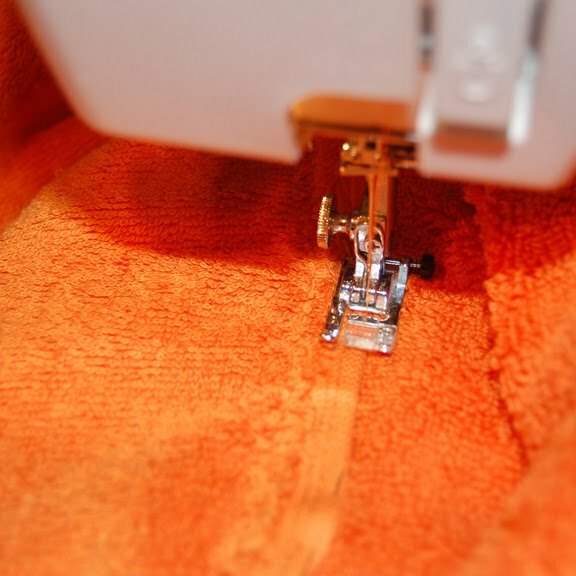 Use your scissors to cut away the lower portion of the hood. 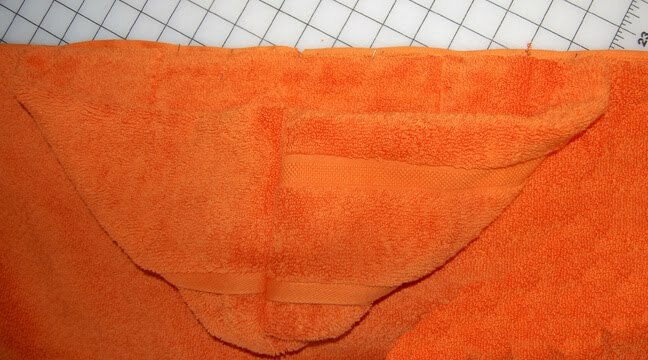 Also, while its folded, make a small notch on the cut bottom edge at the fold. This will mark the center of the hood. Turn the hood right side out. 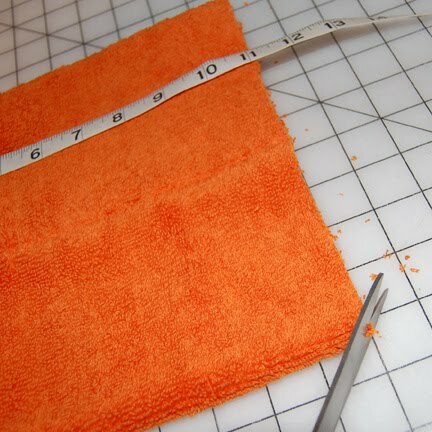 Don’t “rough it up” too much while you turn it, or you’ll have terry cloth loops all over your sewing space. 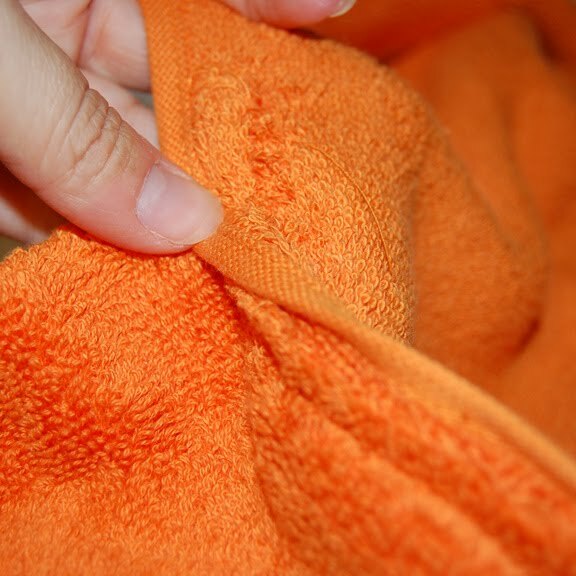 Fold the large towel in half to find the center of one of the longer sides. Mark this center with a pin. 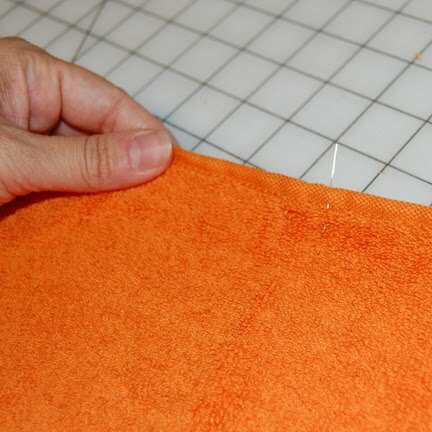 Stitch the hood to the towel using a 1/2” seam allowance. Back stitch at the beginning and end of the seam. Ok, here’s the fancy flat-felled seam part. The first picture above is the seam, from the inside of the hood. 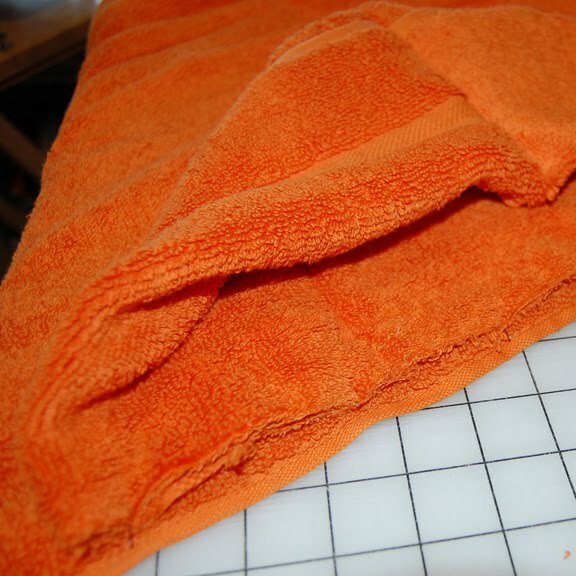 Simply, fold the towel’s finished edge up, over the cut edge of the hood. Pin the finished towel edge along the inside of the hood. Stitch from the inside of the hood along the edge of the bath towel’s finished edge. Back stitch at the beginning and end. This type of seaming completely conceals the raw seam allowance. 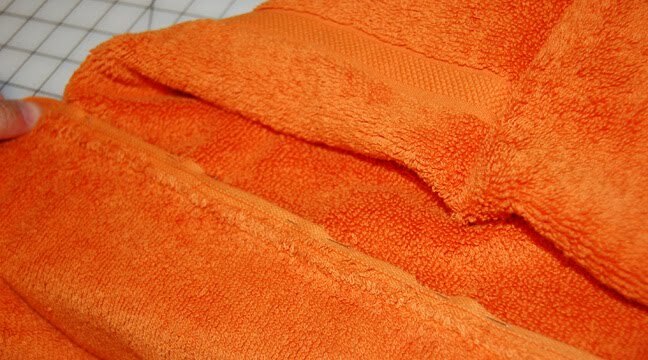 Cut terry cloth frays like no-body’s business, so I encourage you to try this seam finish on this project. *A flat-felled seam is a seam finish traditionally done on the right side of a garment to finish the seam and hide the seam allowance. You can find a flat-felled seam on the side seam of jeans. If you make it, feel free to share it in the ReannaLily Designs Flickr pool. I love it! Thanks for the tutorial. I can't wait to try it! It is very orange! Great OSU color 😉 Thanks for the tute. I may make some for baby showers. You're right about the store bought ones only being used for the first few months!